This piece was previously published on March of 2014. It has since been revised. I hope you enjoy it!. I’ve been thinking about an article I read on the Maria Shriver website. I love this site because it has stories and information relating to Alzheimer disease and their caregivers as well as women in general. Maria Shriver wrote this particular article titled “What’s In Your Toolkit for Life“. She describes the things she needs to get through her life and to become the best person she can be. What would I put in my toolbox? The sad thing is I haven’t a clue. Lately, I have been flying by the seat of my pants just getting through the day-to-day. I haven’t taken the time to really think about what I am doing and how I am going to go about doing it in the future. I try not to look too far ahead these days. I know I want to be the best caregiver I can possibly be, but how do you do that? I have been on a mission to learn everything I can not only about Alzheimer’s disease and dementia, but also Rheumatoid disease and autoimmune diseases. I know that to be able to take care of mom the best way I can I have to be able to maintain my own health as well. Keeping organized is very important, but that sometimes becomes difficult with so many doctors offices and medication instructions. I have to make sure that I write everything down so nothing gets confused (Like showing up Monday for a MRI scheduled for Tuesday). I also have to make sure that I make time every day to spend one on one time with mom just talking. I thought at first that I wouldn’t talk about Alzheimer’s disease with her. Not the nitty gritty, but I have changed my mind. I explained it all and what will happen. I showed her the video from the Alzheimer’s Reading Room called “What is Alzheimer’s Dease is and What It Does“. She knows this is affecting her and the NOT knowing was really bothering her. We have these talks almost daily (Well, we have the same talk daily). The points that I try to stress more than what the disease is going to do is: no matter what it does, I will be here with her. That she will be taken care of, that she will be loved and that she will be safe. This is what she needs to hear, not that I will soon be bathing and feeding her. The future will come soon enough. Back to the question “What would I put in my toolkit”. I would put in a book to learn from, a yo-yo to teach me to relax and not take everything so seriously, an egg timer to remind me that time flies, and a map to remind me to stay on the right path. 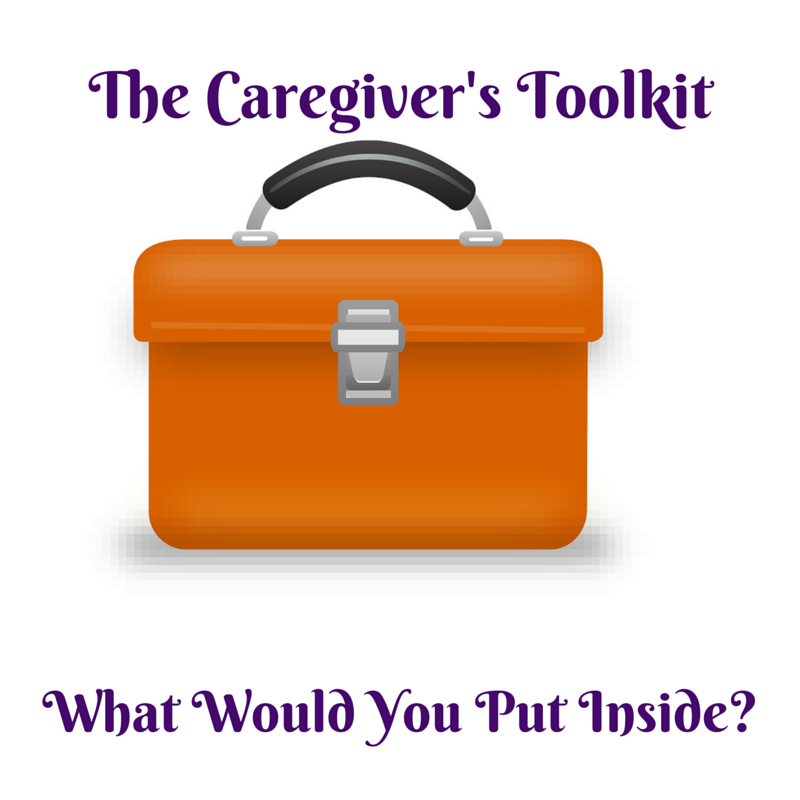 What would you put in your toolkit? I’m right there Rena where you were in the beginning, going from day to day without much thought about how I’m going to handle it. Plus, I’m never really alone (only very late in the evening, when I’m too exhausted to think) so it’s really hard for me to just stop and think. In fact, I found refuge from going insane in my blog, where I can drift off with my thoughts into humorland and forget about the devastating and uneasy rest. That’s exactly why I started blogging Abby. I am so isolated that I only get out of the house a couple times a week to the grocery or out to dinner. It is so hard in the beginning because honestly you are grieving. You are grieving for you freedom and the life that you had. It does get better and a lot of that is seems because you become resigned to it. Thinking of you my friend. Good thoughts here. My toolkit? I’ll have to think about it! Thanks Teresa! It’s so great to hear from you. I hope things are going well for you! I remember your post from last year and enjoyed reading this one. Ah, the wonderful (??) world of caregiving. I triple heart you today, my friend. So glad you wrote this. P.S. I love the design of your blog! Thanks so much Cathy on both counts! I did all the design work here on my own. She loves you too. And so do we readers who find solace in your writing. Your blog would be in my tool kit. I like your tool kit times a lot! When my Mother went into assisted living they have a memory floor we thought would not be used by her. It was. Their take is to not talk about the dementia. I think this is cruel. My Mother knew she was forgetting so why torture her. We told her and she seemed to accept it better and would say “my disease, is acting up and I can’t recall what I was going to say” rather than being mad at herself for forgetting or wondering why she was so forgetful. Leanne@crestingthehill recently posted…do I have the right to write? I hope your toolkit has some air holes for the cat Leanne! Have a great week! I remember this post, and I love the imagery of a toolkit. My toolkit—the memory I had before the Internet allowed me not to need it.And the physical organization I never had. My mother was almost totally blind and kept track of her medications, appointments, talking books etc. Now I have Amazon Echo. Got her (her name is Alexa) for the music and found out she will remember my appointments and basically everything. Tell me the time etc. I’ve never asked her to tell me a joke but apparently she’s told over 500,000. I might because I sure need them. Laughter would be the most important part of my tool kit. Though I really need another live person for that! “The memory I had before the internet allowed me not to need it” that cracked me up and then I got to thinking about it and realized that sadly it’s very true! G Angela recently posted…World AIDS Day !